Boost Mobile and Virgin Mobile (Sprint’s two prepaid brands) today introduced the LG Volt, a new Android handset that first appeared last week. Both Boost an Virgin Mobile are selling the Volt for $179.99 - no contract required. The LG Volt is not based on the LG L90 (as we assumed last week), but on the LG F90. The new handset will offer access to Sprint’s 4G LTE services, including the ultra-fast Sprint Spark network. 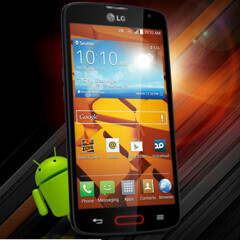 Boost Mobile’s LG Volt is available only in black, while the model sold by Virgin Mobile can be bought only in white. But the handset offers the same specs anyway, including: a 4.7-inch qHD (540 x 960 pixels) display, 8MP BSI rear camera, quad-core Snapdragon 400 processor clocked at 1.2GHz, 1GB of RAM, 8GB of storage space, microSD card support, and a large 3,000 mAh battery. The smartphone runs Android 4.4 KitKat out of the box, and comes with LG’s Knock Code screen unlocking feature. All in all, this is not a bad device for Boost and Virgin Mobile. However, if you don’t need LTE, Boost Mobile has a smartphone that’s definitely a better choice than the LG Volt: the Motorola Moto G, which is offered for only $99.99. Ever since the time of around the Nexus 4, LG has been making some competent phones. It's great how the phone has enough battery to deal with Sprint's LTE implementation. Not a bad prepaid choice. If I was still with Virgin, I probably would grab this one up. LMAO...I read your comment so wrong... I'm going to sleep...--_-- Like...my eyes f*cked me over. Just bought a Moto G last Sat, all the loving are true. Best $99.99 (under $100 buck) Android smartphone atm. Volt who? Past. The Volt is a good phone. Unfortunately, it costs almost twice as much as the Moto G because the Volt has to include the special circuits and large battery required to work with Sprint LTE. Just got me one. This phone is for people like me who are on a budget. Its a good phone for a reasonable price. How is the Moto G a better phone? It has a smaller display, No LTE, Lesser Camera, Smaller Battery and less features (no Remote or simultaneous multi-tasking). The only real thing it has going for it over the Volt is the price and screen resolution. Because it needs to cut a corner somewhere to remain at a low price for it to be an attractive device on prepaid. See that light around tht home button ......I BET YOU SAMSUNG WILL COPY IT. Yup...pre paid is making a name for themselves with better quality phones. Keep it up...and I will never go back to a big carrier again. I finally have a reason to replace the relic that is the LG Rumor Touch!